WE ARE ERNIE, SHERRY, DREW, RICHARD, JOHNNY AND LEVI.. WE LOVE BOATS AND LOVE WORKING AT MINNEYS. WE KNOW MOST OF OUR CUSTOMERS BY THEIR FIRST NAMES, KNOW THE TYPE OF BOAT THEY HAVE AND KEEP FOOD AT THE STORE FOR THEIR PETS. WE HAVE A REAL PASSION FOR WHAT WE DO AND HAVE A REAL SENSE OF ACCOMPLISHMENT WHEN WE FIND JUST THE RIGHT PART OR SAIL YOU ARE LOOKING FOR. 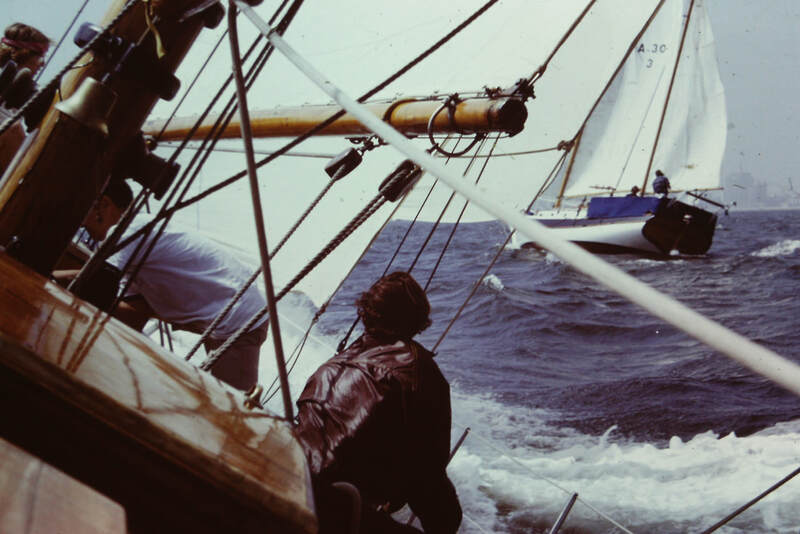 Photo: Kelpie rail down Ancient Mariner race. Long Beach, 1975. The Minney's have been playing with boats in Newport Harbor for sixty plus years. After WWII, George Minney purchased the sixty five foot schooner "Kelpie" and soon had her running charters to Catalina island. He pretty much raised his three sons aboard "Kelpie." In 1959 the Minney men sailed off on a year's voyage to Tahiti. Upon their return, the family opened Minney's Ship Chandlery, a marine consignment store where you could buy, sell and trade boat gear, sails and equipment. The Minneys opened the right business at the right time. Fiberglass boat building was taking off, thousands of novices were building multi-hulls, ferro cement boats and kit boats in their back yards. Weekly truck loads of surplus teak cabinets, louvered doors, and the entire spectrum of boat hardware would arrive from Columbia, Islander, Ericson, West Sail and the rest of the So. Calif fiberglass boat building companies. In short order, Minneys became the GO-TO source for quality new and used gear at AFFORDABLE PRICES. Fifty years has has slipped astern. George Minney has departed to the land of "fair winds and following seas" and Ernie has been at the helm of Minneys for the past 30 years. In 1975 Ernie was lucky enough to purchase the lovely sixty eight foot schooner "Shearwater" from an east coast university. After two years of outfitting her (pretty handy having a boat hardware store) Ernie and his family followed in the wake of the "Kelpie" to Tahiti and then kept heading west. To help make ends meet, Ernie bought and sold nautical gear along the way. Pictured is Ernie with ship's lamps etc. he purchased in Samoa and later sold in New Zealand. 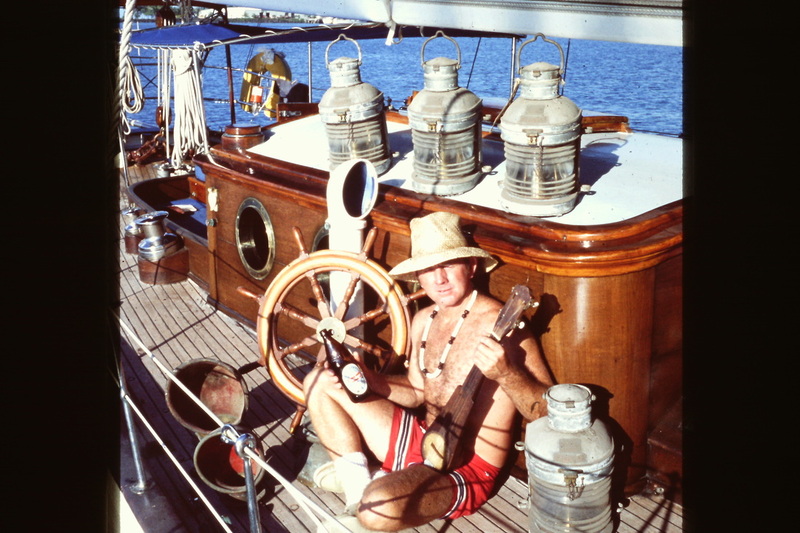 Ernie completed the family circumnavigation in 1970. He sold "Shearwater" ( pictured above now running day sails out of the World Trade Center marina) and returned to full time management of Minneys. At this time he also changed the name to MINNEY'S YACHT SURPLUS, to better describe what his business was all about.